Oh this shot brings back memories. Stourhead is an absolutely stunning landscape garden set in a river valley in Wiltshire which has been artfully dammed and diverted to make for a lovely meandering promenade with plenty of spots for sculptures and architectural follies to be scattered – it was one of the first gardens to be created according to the principles of the English Landscape Movement. There are also more rambling woodland walks full of enormous rhododendrons and other flowering shrubs amongst the trees. There’s a Palladian mansion as well, but I simply wasn’t as interested in that. This was one of the places I made absolutely sure to take my mum to see when she came to the UK to help me out on the birth of my second child. Lots of people have taken photos of Stourhead and put them up on Flickr – most enjoyable looking over them and remembering past trips there. And I found this lovely video montage of autumn photos on YouTube – very relaxing. For the Janeites amongst you, the Temple of Apollo and Palladian Bridge of Stourhead featured in the 2005 P&P movie (as parts of the Gardens of Rosings). I really must make more of an effort to do one of these every week. I love where the intarwebs take me. I found this sweet mashup (subverting the OTP? oh noes!) while I was looking at other P&P stuff: Pride & Prejudice 1995/2005 Keira+Colin / Jennifer+Matthew. Anyway, anybody done any interesting autumn garden touring this year yet here Down Under? 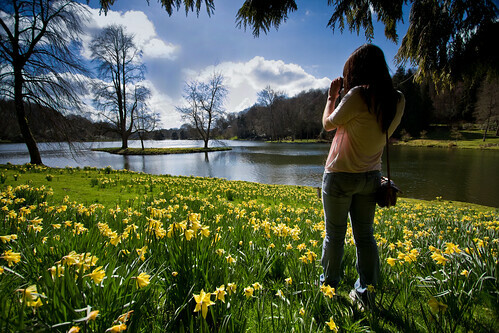 Or lovely spring gardens such as the daffodils at Stourhead for you Northron types? I’ve often wondered why they chose to use the Stourhead temple in the 2005 P&P. It’s so recognisable that it seems odd to see it popping up at Rosings. And by chance, my girls have asked to watch P&P (2005) this afternoon.